If you administer cloud servers or services, such as those from Amazon Web Services or Rackspace, you might be relieved to learn that you don't need access to a notebook or desktop PC to perform routine administrative tasks. Install one of these five apps--AWS Console, Android AWS Manager, Decaf Amazon EC2 Client, Rackspace, or ConnectBot--on your Android phone or tablet, and you can manage your cloud infrastructure from anyplace where you can access the Internet. The first three apps are compatible with AWS, the fourth can be used with Rackspace, and the fifth is a Secure Shell client that's compatible with any cloud host. AWS Console is a free Android app that provides a simple administrative interface to the following Amazon Web Services: Elastic Cloud Computer (EC2), Simple Storage Service (S3), Simple Notification Service (SNS), Relational Database Services (RDS), Route 53 (Amazon's Domain Name System Web service), and CloudFront (Amazon's Web-hosting service). It's primarily designed for tablets running Honeycomb or Ice Cream Sandwich, but it also works on Android phones. AWS Console has a simple but user-friendly interface. Once you've added a user account by inputting your AWS access ID and secret access key (from the AWS Security Credentials page), you can select the desired AWS region and log in. On a tablet you'll see a nicely laid out-navigation system, but on a phone you must use the menu key to navigate between each AWS service and its properties. The app lets you perform most of the basic instance tasks (create, start, stop, reboot, terminate, and so on) available from the official AWS Management Console website. It does not, however, allow you to manage components such as load balancers or network interfaces for Amazon's EC2. Overall, the AWS Console app provides a simple interface for managing your AWS services. Though it lacks graphics and has a plain look and feel, it remains relatively user friendly and serves its purpose. The only gripe I have is that you must select the AWS region before logging in--a pain for admins who deploy services across multiple regions. Since this app doesn't provide password protection, I strongly advise you enable the native Android lock screen PIN, password, or pattern on your device if you decide to use it; otherwise, anyone with access to your phone or tablet will also be able to access your AWS account. You can download the app here. Android AWS Manager, currently in beta, is designed primarily for use on smartphones. Another free Android app (currently in beta), Android AWS Manager provides an interface to the EC2, RDS, and Route 53 AWS services. Though designed primarily for phones, it also works on tablets; it doesn't rotate from portrait to landscape orientation, however--a limitation that I found annoying when I used the app on a tablet. Android AWS Manager supports fewer AWS services than AWS Console does, and it delivers less functionality for the services it does support (it won't allow you to create instances on Amazon's EC2, for instance). On the other hand, unlike AWS Console, Android AWS Manager supports Elastic Load Balancing (ELB), and you can switch between AWS regions while you're logged in. This program is also not password-protected on its own, so you should enable the native Android lock screen PIN, password, or pattern to prevent strangers from accessing your AWS account. You can download the app here. This Android app enables you to manage and monitor your Amazon EC2 infrastructure from either a smartphone or a tablet; it is available for purchase from the Google Play app store for $14.16. Unlike the two free apps we've already covered, Decaf Amazon EC2 Client doesn't support other AWS services, such as Amazon RDS or Route 53. This app nonetheless justifies its price tag with features missing from its no-cost competitors. Decaf Amazon E2 Client justifies its price tag with features that its no-cost competitors don't offer. The first time you run Decaf Amazon EC2 Client, it will quickly step you through the process of configuring it to work with your AWS account. Simply log in to AWS, and the app will access your EC2 key ID and secret access key. 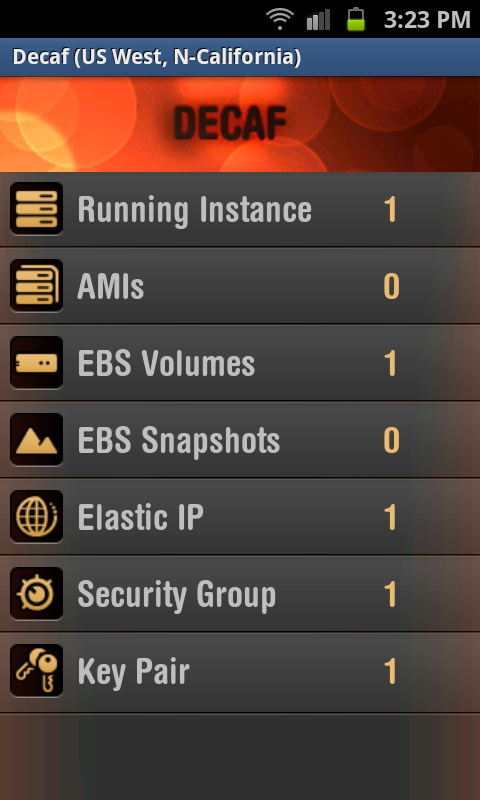 Once it connects, you'll see a listing of the basic EC2 components (Instances, AMIs, EBS Volumes, EBS Snapshots, Elastic IPs, Security Groups, and Key Pair) and the number of those you're using. You can click on each to view its details and to perform basic functions (create, start, stop, reset, terminate, and so on) for most of the supported features. If you also have the ConnectBot SSH client installed (an app we'll discuss in more detail later), you can quickly access your running instances via SSH (Secure Shell). While on the main screen, tap your phone's (or tablet's) menu key to reveal additional features. Tap the Regions button to quickly switch between AWS regions, or tap the CloudWatch button to view the status and historical graphs of your instance's CPU, disk, and, network usage. Unlike the free apps covered earlier, Decaf Amazon EC2 Client is password-protectable, so that unauthorized users won't be able to access and change your EC2 account. 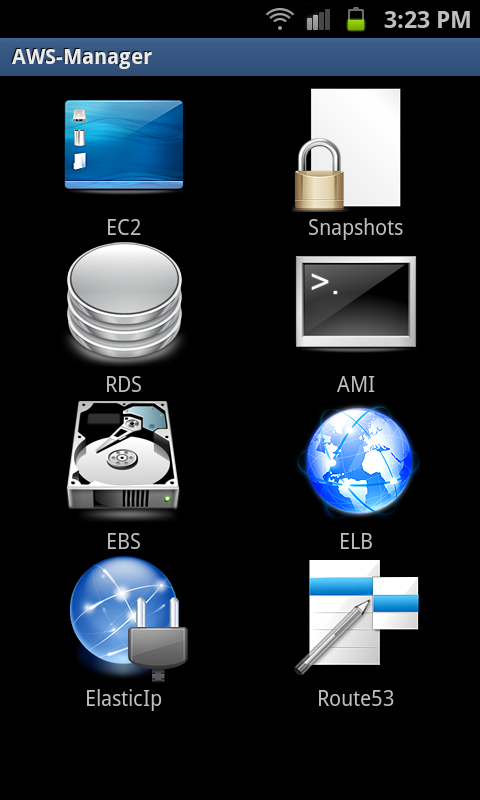 Decaf Amazon EC2 app provides a user friendly interface for managing basic AWS services. You can use it to handle most of the same tasks that you can perform using the official AWS Management Console website. There is no support, however, for managing EC2 components such as load balancers or network interfaces. You can purchase the program at Google's app store. Rackspace developed its own Android app for administering its cloud services. Rackspace developed this free Android app to enable its customers to manage their Rackspace cloud servers, files, and load balancers. It supports multiple accounts for U.S., UK, and custom API endpoints. You can perform all of the basic cloud server tasks, such as creating, renaming, deleting, resizing, and rebooting instances. You can also ping cloud servers, manage backup schedules, and change root passwords. For your Cloud Files you can view and create containers, upload text files, and download and preview files. This Rackspace app also offers password protection, to deter unauthorized access to your Rackspace cloud services. You can download the app here. ConnectBot is a free SSH client for Android phones and tablets. ConnectBot is a free, open-source, Secure Shell client for Android that can be used to administer any Linux or Unix-based cloud machine from the CLI (Command Line Interface). It also supports Telnet and local (Android device) connections. ConnectBot supports simultaneous SSH sessions, secure tunnels, and copy/paste operations between other Android apps. It supports popular emulation modes, Terminal bell alerts, and it has an adjustable scroll-back size. 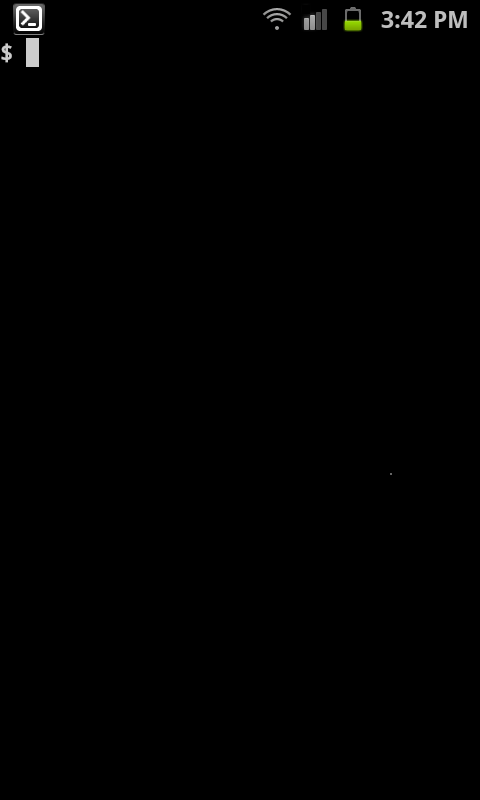 Connections can persist while the app is running in the background, so you can access other apps while connections are open. You can also lock your screen without interrupting a connection. As mentioned earlier, ConnectBot can be integrated with Decaf Amazon EC2, providing the ability to connect to your instances via SSH directly from a shortcut within Decaf. You can download the app from Google Play. Eric Geier is a freelance tech writer. He's also the founder of NoWiresSecurity, which provides a cloud-based Wi-Fi security service for businesses, and On Spot Techs, which provides on-site computer services.